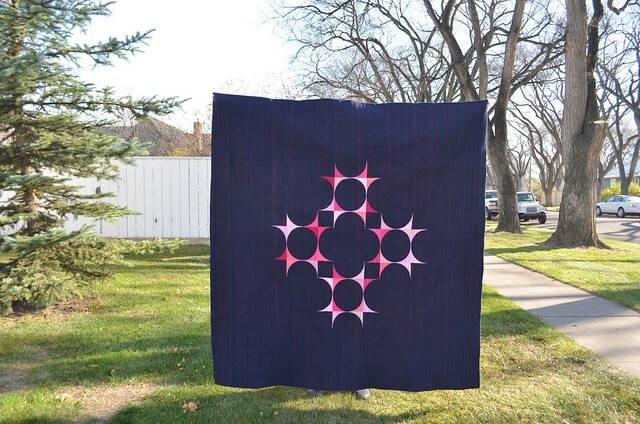 Let me tell you about Twirl, the newest quilt I have designed. She was made from scraps of different pink Kona cottons (maybe 12 colours) and Kona Navy. She is about 62" square after dense quilting and a wash and dry. Twirl fits nicely on the top of a queen size bed and is a pattern well admired by my kittens. They know that navy is perfect for showing off every hair they may shed. I am really happy with this design, I love medallion quilts and I wanted to explore a modern medallion with loads of negative space. I used the Allium block that I designed when I made Echoes, which creates lovely secondary patterns in this arrangement. When I put Twirl on my M illennium Longarm Quilting Machine to quilt, I had a moment. I thought, gee it's time to try something different, so I put two layers of cotton batting. It turns out, for me at least, double layers of batting on a big quilt is not a great idea at all. The quilt is really heavy and she is not that drape-y, especially with the dense quilting from 1" to matchstick. She is, on the other hand nice and warm and I am hoping for just a little more softening up with the next wash, but I will be sticking to single layers of batting in future. On the back of Twirl I placed 7 of my favourite fabrics in nice big chunks. I had hoped to have a pattern ready for Twirl by now, but life has unexpectedly intervened. Watch for it soon. If you are new to my blog, welcome. You can quickly see my quilting style by checking out the My Quilts tab. I have entered Twirl in the Original Design category of the Blogger's Quilt Festival over at Amy's Creative Side. There are so many beautiful quilts entered in the festival this year! Twirl was also on my Q4 Finish Along list! 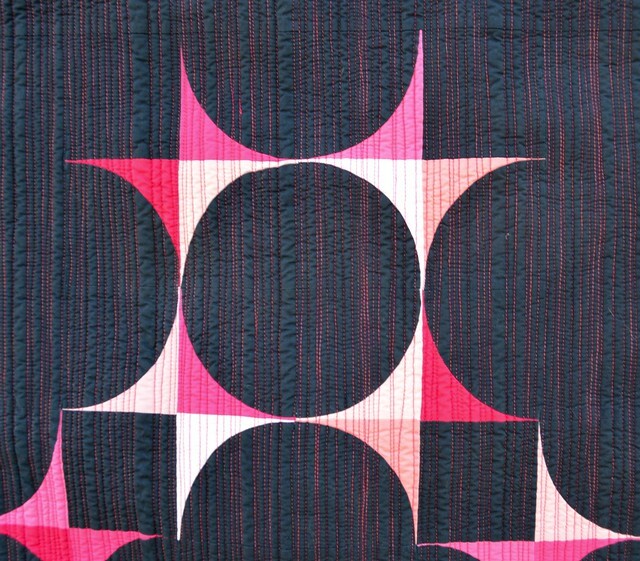 The secondary design of the blocks at the center of the quilt is a great inversion for the thin pink arms of the piecing. I also really like that you used a bold pink thread in the quilting. So many times I feel like quilters (me included!) are afraid of bright contrast in quilting thread selection, and I love getting to see how bold contrasts work in designs like this. I think it gives the Kona Navy great depth and a sheen to make it seem like a shot cotton from a distance. Beautiful! Beautiful! I love the value changes in the pink and the stitching just adds so much. Great work as always! Beautiful quilt! I especially love the colors you chose. I am in love with your quilt! Wow! She is wonderful and the texture is yummy!!! This is so beautiful Leanne. I love how it is so in keeping with your previous quilts but at the same time is completely different. Well done. This is a beaut! Love the colored quilting thread and interesting to hear about what you thought about the double batt. A stunner! The combination of pink on the blue background is gorgeous. I'm especially drawn to the quilting (of course) with pink thread! Perfect combination! 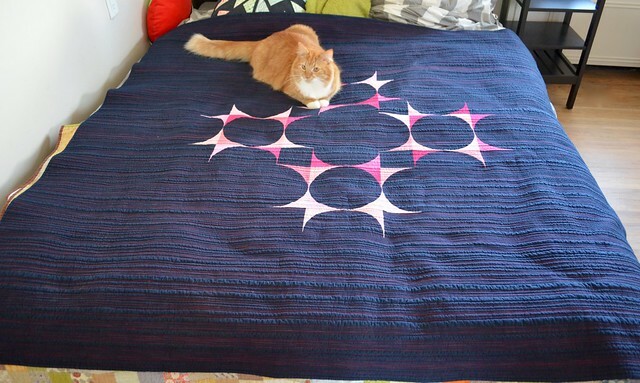 Love this quilt and of course the quilting. So strong and yet delicate. 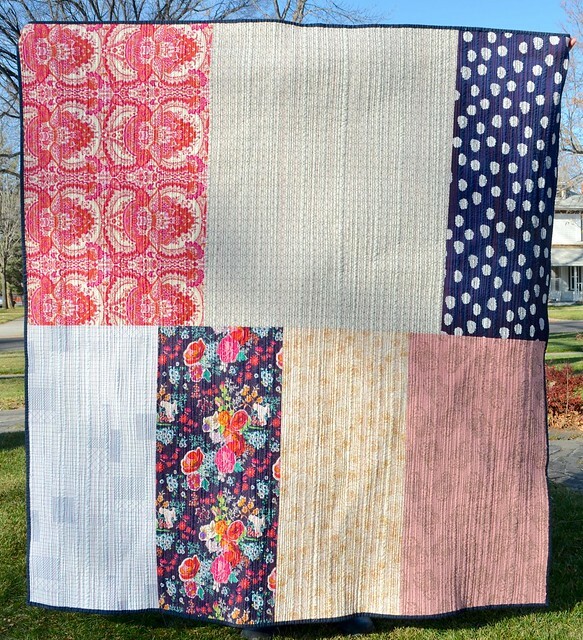 Beautiful quilt; love the matchstick quilting with that pink thread! 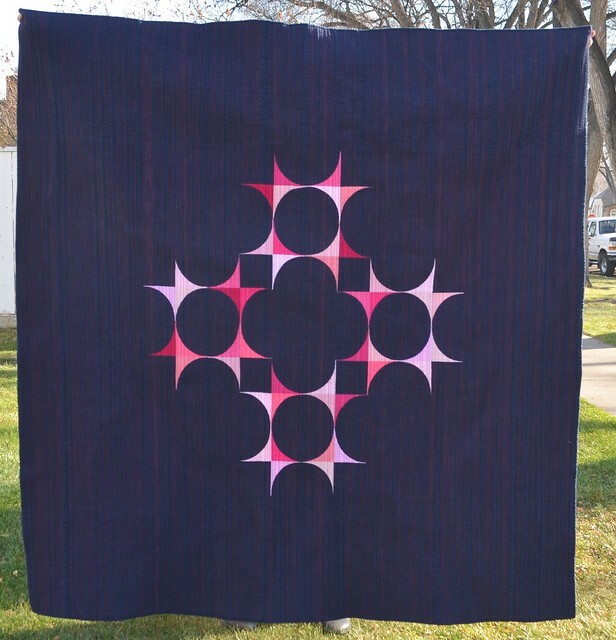 Between the dark background, the multi shades of kona pink and the bold quilting thread, this piece has an almost iridescent quality that is striking! And the pattern you've designed is gorgeous. Beautiful work (as always). Beautiful quilt, as always Leanne! I love this so much. The pink thread is the bomb. This could be my favourite quilt you have made Leanne! Until the next one of course!